Beauregard and Lee, at two conferences held recently at Richmond, advocated the policy of invading the north, and designated the following three points of attack — from Cumberland and Williamsport into Pennsylvania, from Danville and Cincinnati into Indiana and Ohio, and from Paducah and Cairo into Illinois. The above suggestions were, however, not agreed to. 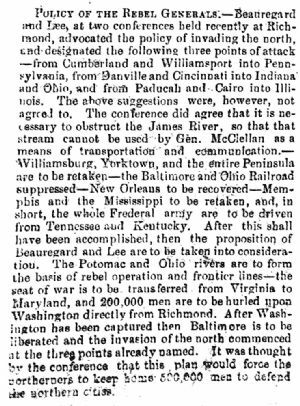 The conference did agree that it is necessary to obstruct the James River, so that that stream cannot be used by Gen. McClellan as a means of transportation and communication.— Williamsburg, York town, and the Entire Peninsula are to be retaken—the Baltimore and Ohio Railroad suppressed—New Orleans to be recovered—Memphis and the Mississippi to be retaken, and, in short, the whole federal army are to be driven from Tennessee and Kentucky. After this shall have been accomplished, then the proposition of Beauregard and Lee are to be taken into consideration. The Potomac and Ohio rivers are to form the basis of rebel operation and frontier lines—the seat of war is to be transferred from Virginia to Maryland, and 200,000 men are to be hurled upon Washington directly from Richmond. After Washington has been captured then Baltimore is to be liberated and the invasion of the north commenced at the three points already named. It was thought by the conference that this plan would force the northerners to keep home 500,000 men to defend the northern cities.